Why you need to diversify when investing in startups. Today, with US stock ownership at a record low, insiders calling Wall Street “rigged” and startups like Uber and Zenefits grabbing headlines on big money rounds, an increasing number of adventurous investors are looking beyond public equity markets to startups as an alternative if highly risky asset class. With these would-be startup investors in mind, what’s the best strategy that experienced angels have to offer? Diversify. Investing in startups is risky. If you make just one investment, you are likely going to lose everything. If you make two, you are still likely to lose money. If you make five, you might get all your money back across all five investments. If you make ten, you might start making money on the aggregate set of investments. Portfolio diversification is a form of due diligence. Experienced startup investors like Fred Wilson and Dave McClure, who respectively run a leading VC firm and the largest startup accelerator, recommend making smaller bets in more startups to maximize odds of including one of the great “Thunder Lizards” like Uber or Airbnb in your portfolio. 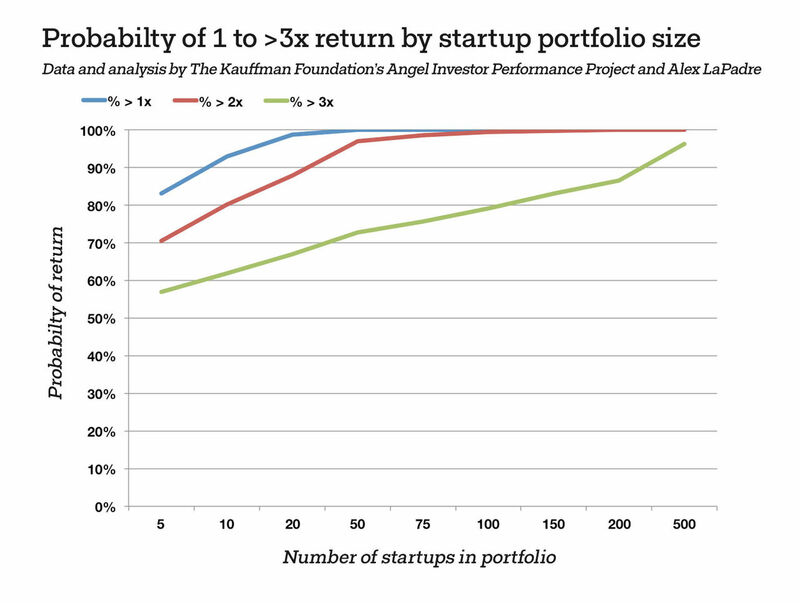 Anecdotally angels agree that startup outcomes tend to be binary, with most failing to return at least a 1x return, or invested capital, and a very few delivering extraordinary returns. Incredibly, the big winners overshadow the losers so much so that they make angel investing an attractive as an asset class. Others like Alex LaPrade have taken a data-oriented approach and analyzed how diversification affects expected portfolio returns from the largest and most reliable dataset, the Kauffman Foundation’s Angel Investor Performance Project (AIPP). The chart above shows the results of LaPrade’s Monte Carlo simulation of investing in the 1,137 startups with exits from the AIPP dataset at various portfolio sizes. At only 1 or 2 startup investments, an investor’s chances of merely breaking even are at 83%. But increase portfolio size up to 20, and that same investor gets a nearly 99% chance of break even and 67% chance of achieving a greater than 3x return. At the extreme, investing in 500 startups increases the investor’s chance of break even to a near certainty, and chance of at least a 3x return to 96%. LaPrade’s conclusions line up more or less with others who have analyzed the AIPP dataset. They support the insights of successful angel investors like Fred Wilson and Dave McClure, and demonstrates how diversification can offset the net losses of most startups with exposure to the winning few. Of course angel investors cannot invest in any and every startup just for the sake of diversification. There is no “startup index fund” that enables investors to spread risk evenly as in the public equity markets. To build a diversified portfolio, startup investors still need to hustle into “the good deals” – which is difficult and time-consuming, even for full-time professional angels. That’s where sites like Wefunder make all the difference. Would-be angel investors can rely on the collective signal of over 30,000 angel investors on Wefunder to filter through deals, investing as little as $100/pop. And they can use Wefunder’s new Portfolio funds to conveniently find and invest in large batches of high-quality startups. When you consider the wisdom of successful angel investors, the insights drawn from the available data, and the headlines that scream about big money startup exits, it’s easy to see why this diversified approach to startup investing is now attracting so many followers.